Why to join Merchant navy? A very important thing for you to note! I am not a person who is working or who is having working experience in Merchant Navy! I am being asked many boubts and queries; which I am not capable of answering. There was very less information available on the internet when I created this page. So, this page was made in order to give a brief information, to the people, inspiring to get into merchant navy. If You you have doubts. I have given links to the reputed institutes. You can get contact information on their websites and you can call them up and ask your doubts if you want to! The Merchant Navy is a non-combatant commercial fleet, which deals with transporting cargo and occasionally, passengers, by sea. 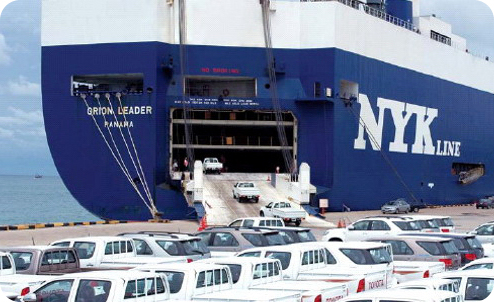 Its fleet is therefore composed of passenger vessels, cargo liners, tankers, carriers, as well as other special types of vehicles. A career in this field is full of adventure and long voyages to exotic places. Above all this, the excellent pay and promising promotional opportunities make the career lucrative and exciting in spite of all the hard work life and long absence from family and home. What is the big attraction of the merchant navy? Two things come to mind – money and foreign travel. There are other benefits like tax free income, quick promotions and an exciting life. But the money is the main temptation. You get fat pay checks and you don’t pay tax (if you stay out of the country for more than 6 months in a financial year). You start earning a big salary at a very young age. To give you an example, the starting salary for a 22 year old 3rd officer or 4th engineer (junior most officers on board ships) on an oil tanker is be more than 1500 $ per month (conservatively speaking). This amount depends on the type of ship and the company you join! Officers normally work on a contract basis. Junior officers do 6 to 9 month contracts, while senior officers do 3 to 6 months on board. Remember that you get paid ONLY when you are on board. So, your salary is half of what you are said to get. The catch is, you stay away from home for extended periods of time. In fact you spend most of your time at sea rather than on land. Its not as if you reach a port and everyone goes ashore. Work continues with every officer / crew member working in shifts (watches as we call them). You are free to go ashore once you have completed your watch but don’t forget that you have to come back from your shore leave and work again. So, you either sleep or you go ashore. Work on a ship, never stops. As long as the ship is doing something – sailing, loading / discharging cargo, it’s making money for the ship owner. Port stays have gone down considerably so the ship is in port for a short time. Of course, this depends on the type of ship you are on. Container ships are in port for a few hours (YES few hours), oil tankers for 24 hours, cargo ships and bulk carriers stay longer in port. Watches in port are usually on a 6 on 6 off basis, 6 hours on duty, 6 hours off duty, and then you are back to work. Hence you cannot go ashore in every port because you need to rest sometime. The ship owner is pays you to stay on board, not to go ashore! Its not all bad news, you do get to go ashore and do some shopping and maybe sight seeing. Ports are normally far away from civilisation. Travelling to and fro takes up time and is not cheap. With visa restrictions, many countries will not let you stay back for a holiday after you complete your tenure on your ship. So now you know why the ship owner pays you so much. You are being paid for staying away from family and home, you are being paid for long stints at sea and hardly any chance to go ashore. By the way, the girl in every port stories you have heard is pure myth!!! You will not get time to meet girls and if you do meet girls then they will be the wrong kind. Some companies do allow officers (usually senior officers) to carry their family (wife / kids) with them. If you say, “I can handle everything, just as long as I get paid well.” That’s just fine, as long as you are aware of what you are getting into! Go to the DgShipping website! See the list of approved training institutes! And then search for the official website of that Institute through Google! 1. Samundara Maritime Institute, Lonavala. 2. Great Eastern Academy, Lonavala. 3. Vishwakarma Maritime Institute, Kondhwa, Pune. You can find information for entering that particular Institute by contacting those Institutes! These are decently good institutes, to do your required courses in. 2. International Maritime Institute, Greater Noida. 3. Anglo Eastern , Mumbai. 5. Chidambaram Institute of Maritime Technology, Kalpakkam, Tamilnadu. 6. CV Raman College of Engineering, Bhubaneswar, Orissa. -The eligibility for the course is Graduate in B.E Mechanical engineering with an aggregate of 60% (SC/ST-55%). You need to have a valid IIT-JEE score after 12th to go for Merchant navy! You can prepare for the entrance exams that various maritime institutes conduct for the intake of candidates! The admission process consists of interview and a entrance exam. Get in contact with the institute for syllabus. For the Engine Side > Exams contain questions on aptitude, essay to check our English, and the main thing is the mechanical engineering questions. There are also other Merchant Navy Universities coming up in India. A bulk carrier, bulk freighter, or bulker is a merchant ship specially designed to transport unpackaged bulk cargo, such as grains, coal, ore, and cement in its cargo holds. Since the first specialized bulk carrier was built in 1852, economic forces have fueled the development of these ships, causing them to grow in size and sophistication. Today’s bulkers are specially designed to maximize capacity, safety, efficiency, and to be able to withstand the rigors of their work. 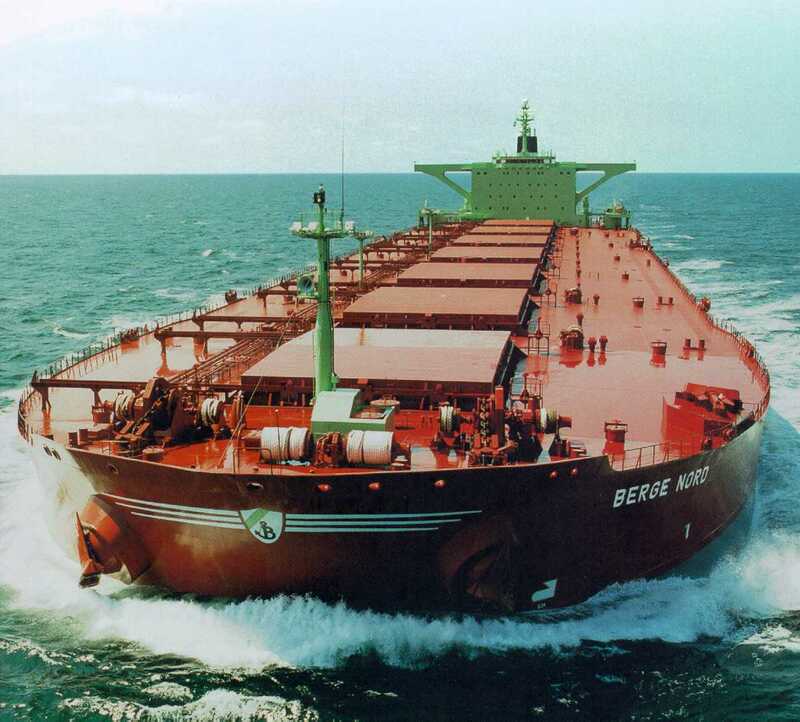 Today, bulkers make up 40% of the world’s merchant fleets and range in size from single-hold mini-bulkers to mammoth ore ships able to carry 365,000 metric tons of deadweight (DWT). A number of specialized designs exist: some can unload their own cargo, some depend on port facilities for unloading, and some even package the cargo as it is loaded. Over half of all bulkers have Greek, Japanese, or Chinese owners and more than a quarter are registered in Panama. 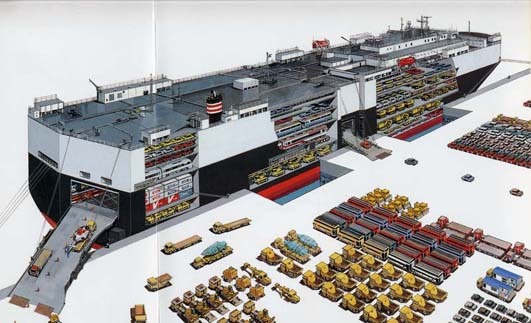 Korea is the largest single builder of bulkers, and 82% of these ships were built in Asia. A bulk carrier’s crew participates in the loading and unloading of cargo, navigating the ship, and keeping its machinery and equipment properly maintained. Loading and unloading the cargo is difficult, dangerous, and can take up to 120 hours on larger ships. Crews can range in size from three people on the smallest ships to over 30 on the largest. Bulk cargo can be very dense, corrosive, or abrasive. This can present safety problems: cargo shifting, spontaneous combustion, and cargo saturation can threaten a ship. The use of ships that are old and have corrosion problems has been linked to a spate of bulker sinkings in the 1990s, as have the bulker’s large hatchways, important for efficient cargo handling. New international regulations have since been introduced to improve ship design and inspection, and to streamline the process of abandoning ship. 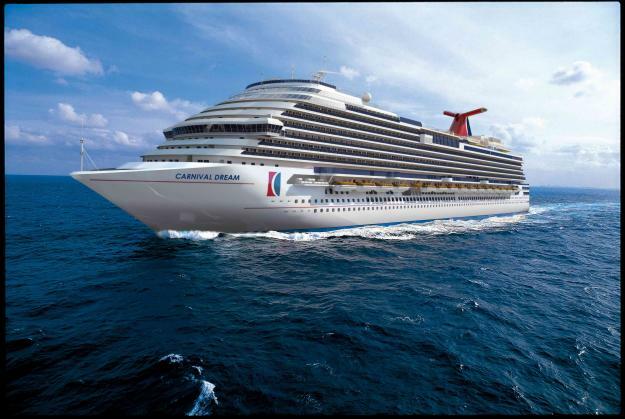 A cruise ship or cruise liner is a passenger ship used for pleasure voyages, where the voyage itself and the ship’s amenities are part of the experience, as well as the different destinations along the way. Transportation is not the prime purpose, as cruise ships operate mostly on routes that return passengers to their originating port, so the ports of call are usually in a specified region of a continent. In contrast, dedicated transport oriented ocean liners do “line voyages” and typically transport passengers from one point to another, rather than on round trips. Traditionally, an ocean liner for the transoceanic trade will be built to a higher standard than a typical cruise ship, including high freeboard and stronger plating to withstand rough seas and adverse conditions encountered in the open ocean, such as the North Atlantic. Ocean liners also usually have larger capacities for fuel, victuals, and other stores for consumption on long voyages, compared to dedicated cruise ships. Although often luxurious, ocean liners had characteristics that made them unsuitable for cruising, such as high fuel consumption, deep draught that prevented them from entering shallow ports, enclosed weatherproof decks that were not appropriate for tropical weather, and cabins designed to maximize passenger numbers rather than comfort (few if any private verandas, a high proportion of windowless suites). The modern cruise ships, while sacrificing qualities of seaworthiness, have added amenities to cater to tourists, and recent vessels have been described as “balcony-laden floating condominiums”. Reefer ship is a type of ship typically used to transport perishable commodities which require temperature-controlled transportation, mostly fruits, meat, fish, vegetables, dairy products and other foodstuffs. Side-door vessels have water tight ports on the ships hull, which open into a cargo hold. Elevators or ramps leading from the quay serve as loading and discharging access for the forklifts or conveyors. Inside these access ports or side doors, pallet lifts or another series of conveyors bring the cargo to the respective decks. This special design makes the vessels particularly well suited for inclement weather operations as the tops of the cargo holds are always closed against rain and sun. 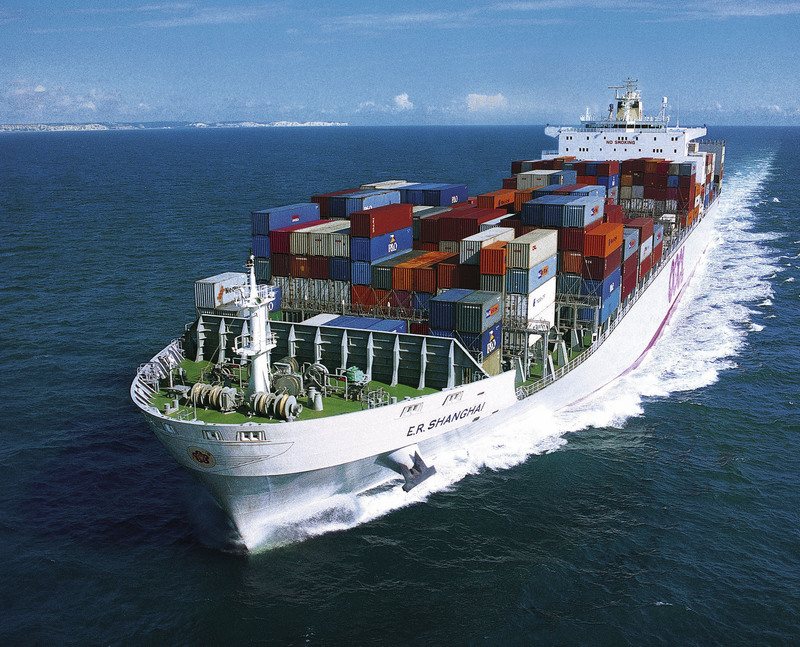 Refrigerated Container vessels are specifically designed to carry containerised unit loads where each container is an individual refrigerated unit. These ships differ from conventional container ships in design and power generation equipment. A major use of refrigerated cargo hold type ships was for the transportation of bananas but has since been partly replaced by refrigerated containers that have a refrigeration system attached to the rear end of the container. While on a ship this is plugged into an electrical outlet (typically 440 VAC) that ties into the ship’s power generation. 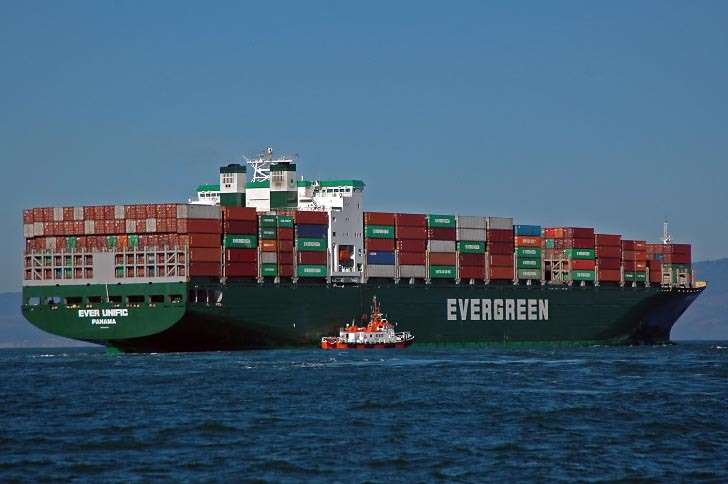 Refrigerated container ships are not limited by the number of refrigeration containers they can carry unlike other container ships which lack sufficient refrigeration outlets or have insufficient generator capacity. Each reefer container unit is designed with a stand-alone electrical circuit and has its own breaker switch that allows it to be connected and disconnected as required. RO-RO vessels have built-in ramps which allow the cargo to be efficiently “rolled on” and “rolled off” the vessel when in port. While smaller ferries that operate across rivers and other short distances often have built-in ramps, the term RO-RO is generally reserved for larger ocean-going vessels. The ramps and doors may be stern-only, or bow and stern for quick loading. An oil tanker, also known as a petroleum tanker, is a merchant ship designed for the bulk transport of oil. There are two basic types of oil tankers: the crude tanker and the product tanker.Crude tankers move large quantities of unrefined crude oil from its point of extraction to refineries.Product tankers, generally much smaller, are designed to move petrochemicals from refineries to points near consuming markets. 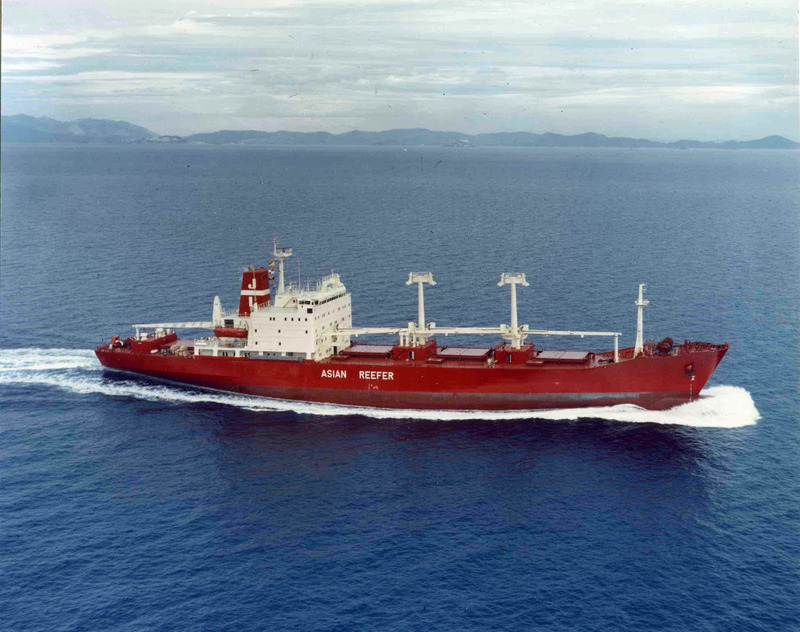 A chemical tanker is a type of tanker designed to transport chemicals in bulk. Ocean-going chemical tankers generally range from 5,000 metric tons deadweight (DWT) to 40,000 DWT in size, which is considerably smaller than the average size of other tanker types due to the specialised nature of their cargoes and the size restrictions of the port terminals where they call to load and discharge. Chemical tankers normally have a series of separate cargo tanks which are either coated with specialised coatings such as phenolic epoxy or zinc paint, or made from stainless steel. The coating or cargo tank material determines what types of cargo a particular tank can carry: stainless steel tanks are required for aggressive acid cargoes such as sulfuric and phosphoric acid, while ‘easier’ cargoes – e.g. vegetable oil – can be carried in epoxy coated tanks. At the moment there is a boom in the fleet, with a total of more than 140 vessels on order at the world’s shipyards. Today the majority of the new ships under construction are in the size of 120,000 m³ to 140,000 m³. But there are orders for ships with capacity up to 260,000 m³. 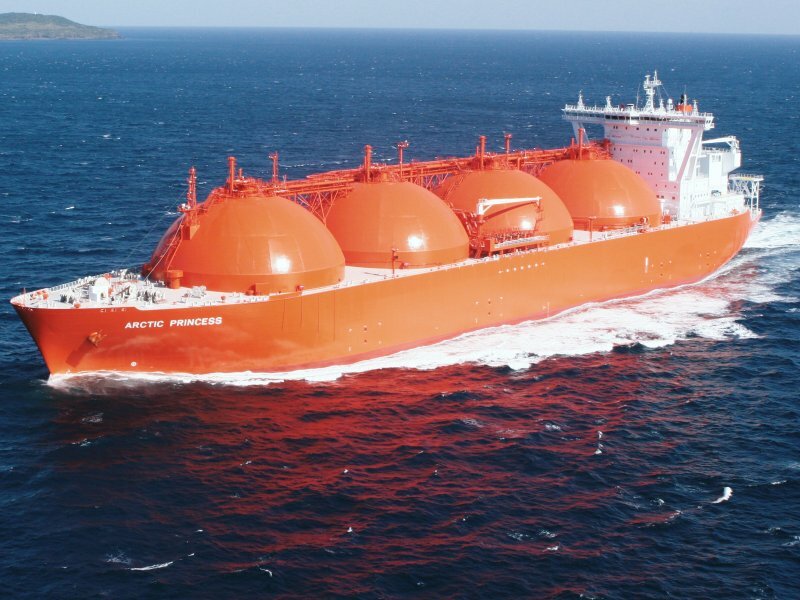 As of 6 March 2010, there are 337 LNG ships engaged in the deepsea movement of LNG. Man has not only harnessed the seas for transportation but for industrial purposes also. The offshore industry owes all credit to the development of FPSO’s (Floating Production Storage and Offloading) units. Over the last 30 years, FPSO vessels have acquired a place of importance in the area of oil and gas production. They are an essential to exploit the reserves to the best of their potential. Oil has been exploited from off shore locations since 1950. The first oil FPSO was the Shell Castellon, which was built in Spain in the year 1977. 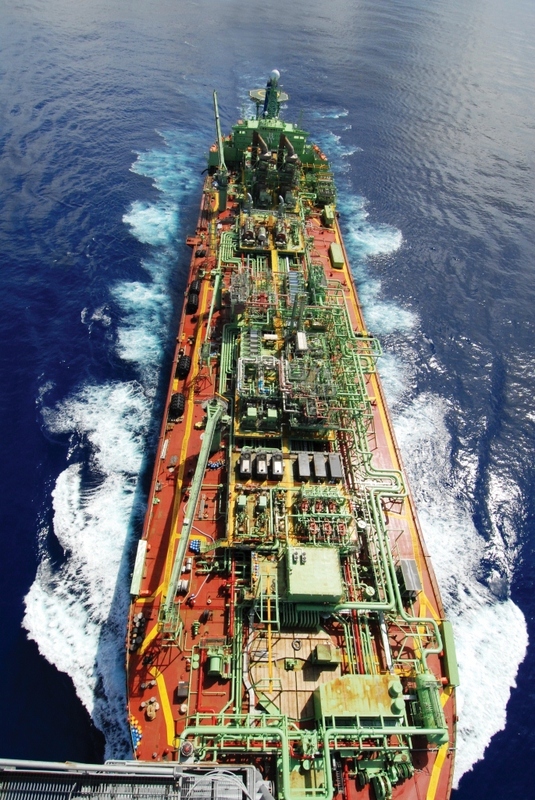 Why FPSO Vessel Over Pipelines? In our section related to deep ocean engineering, we have studied how underwater pipes are laid in the sea. Yet laying of pipelines is always not a feasible option. The scale of economics always does not run in favor of this option. Oil and Natural Gas are an absolute essential for the industry. Even a small reserve cannot be ignored and for such a small reserve laying of pipeline may not an ideal option. FPSO’s are the best alternative in such cases. An FPSO is a floating vessel that has been designed in a manner that makes it conducive to receive, process and store oil or natural gas. These stages are necessary before the produce is offloaded onto a tanker or a pipeline. 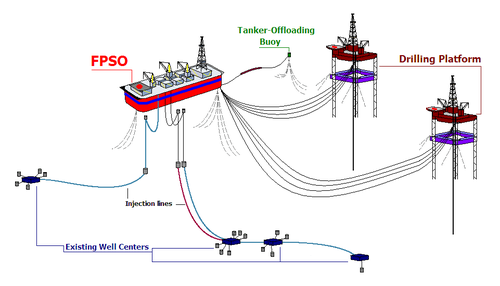 Oil tankers may be converted to function as a FPSO. Vessels may be used for oil storage alone. Such units are termed as Floating Storage Units or FSU’s. A Floating Production, Storage and Offloading vessel (FPSO; also called a “unit” and a “system”) is a type of floating tank system used by the offshore oil and gas industry and designed to take all of the oil or gas produced from nearby platforms or templates, process it, and store it until the oil or gas can be offloaded onto a tanker or transported through a pipeline. Oil produced from offshore production platforms can be transported to the mainland either by pipeline or by tanker. When a tanker solution is chosen, it is necessary to accumulate oil in some form of tank such that an oil tanker is not continuously occupied while sufficient oil is being produced to fill the tanker. Often the solution is a decommissioned oil tanker which has been stripped down and equipped with facilities to be connected to a mooring buoy. 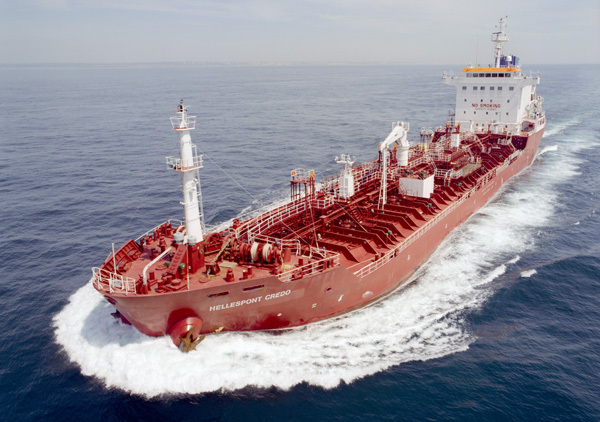 Oil is accumulated in the FPSO until there is sufficient amount to fill a transport tanker, at which point the transport tanker connects to the stern of the floating storage unit and offloads the oil. The FPSO’s can be permanently moored or diconnectable. It is the area in which the vessel has to be used that controls the basic design. In calm waters a simple design can serve the purpose but in case of volatile waters the structures will be designed accordingly. The basic difference is in the injection lines, which are external in case of calm waters and internal any other case. The second factor that is kept in mind while designing an FPSO structure is the direction of the wind in that area. The effort is to reduce the effect of the environment. With increasing environmental and safety concerns the functioning of FPSO vessels is continuously monitored by international agencies (International Maritime Organization) The organization has issued detailed guidelines for carrying out the various functions and handling of discharge which may be a by product of the processing done on the vessel. With the very nature of the product stored on these vessels being inflammable, safety provision and training acquire immense importance. The World’s Largest FPSO Vessel: The Girassol FPSO, is one of the largest FPSO vessel functioning in the world today. It was constructed in Korea. It has been constructed as a joint venture between Bouygues Offshore and Stolt Offshore within a period of 21 months. The vessel has a production capacity of 200,000 barrels per day and a storage capacity of 2,000,000 barrel storage capacity. I am not a person who is working or who is having working experience in Merchant Navy! I am being asked many boubts and queries; which I am not capable of answering. There was very less information available on the internet when I created this page. So, this page was made in order to give a brief information, to the people, inspiring to get into merchant navy. 240 Responses to HOW AND WHY TO JOIN MERCHANT NAVY ? i want to join the merchant navy.and i want to know the process to join these colleges. sir, i am a mechanical engg. (final year )student nd want to join merchant navy. Please Get in contact with the institutes that I have mentioned on this page! They May help you! The eligibility for the course is Graduate in B.E Mechanical engineering with an aggregate of 60% (SC/ST-55%). Sir i want to ask that what is the criteria for an electronics& communication engineer to get a job in merchant navy. Sir plz reply …. Please contact the institutes that I have mentioned for the information you are asking! They may help you! Yes you can get there and there is a good chance into good training institute. normally you will be having a written entrance exam on the basis of which you will be called for interview by the institute. Sir, you need to consult the dgshipping approved institutes directly as you said you had 3 years war ship experience. Sir i am doing b.tech mechanical engineering 2nd year from a private university bt i want to join merchant navy after b.tech can i join it please reply me soon. Yes! you can join merchant navy on both sides> ENGINE side or DECK side! You can join Any institute which offers 1 year pre-sea course But only that is DIRECTLY approved by DGshipping. You can check the list of approved institutes on dgshipping website! Sir i am a mechanical enginering student doing my b.tech from a private colege. I want to know whether i can join directly with my enginering percentage or should i have to give separate exams for getting into any of the college. After graduation. You need to give a different exam of the institute approved by DGshipping and complete 1 year pre-sea training through that institute. Firstly you need to give an entrance examination conducted by IMU! You have to give that examination even if you want to enter private institutes! The rest you will understand while undergoind the process! i m doing +2 in non medical. Can i join marchant navy directly after +2.. If yes what r eligible marks .. When they conduct entrance test…? Pls tell me as soon as posible….. Appear for IIT-JEE! then u can proceed further! Go to the DGshipping website! there you can see the list of approved institutes! Details of application forms to join merchant navy for one year GME course. Is there any current opening, plz inform me. You need to keep on seeing each institutes website for that! Got to the DgShipping website! see the list of approved training institutes! And then search for the official website of that Institute through Google! Sir, I am currently pursuing my B.E. in Electrical and Electronics engineering branch. Can I join merchant navy? If so, what’s the procedure? For that info, you can go through the following website! Currently i am doin my 3rd yr BE (Mechanical). I understand as an engineer i must get into the Engineering field of Merchant navy, also i must undergo a training course of 1 yr. My question how can i prepare myself for the 1yr course so that i can become an Junior engineer eventually? Exams contain questions on apti, essay to check our english, and the main thing is the mehanical engineering questions. I have no idea about that! But you can find the info by contacting the institutes! These are also decent institutes to do your required courses in. Currently I am doin my 3rd yr BE (Mechanical). I just wanna know is it necessary to be nominated by a shipping company to join merchant navy? Are they any advantages in that? It is not necessary to be nominated by a shipping company to join merchant navy! It is just that you will have peace of mind after completing your course that you are already placed in that shipping company and you do not need to run for placements! you will have to bare all the expenses on your own required for completing the course in general. But if the Institute is Good then I don’t think that you will face any problems in getting placed! Also let me tell you that a few government institutes accept candidates who haved been nominated(placed) by a shipping company. Sir i”ve recieved 59% marks in pcm and 63% in english.I am interestd in nautical science and I want to study.Am I eligible for your college. First of all I do not own or run or work in any college! I have given the links to various college websites in the comments! please go to the respective websites and check if you are eligible or not! And I think you need to have a valid IIT-JEE score after 12th to go for Merchant navy! My name is siddharth and i am doing automobile engineering (4th year).My question is ,can i join the merchant navy .i will be waiting for your reply Sir. I have provided links of different merchant navy training Institutes in the comments. Please go to those respective websites. and enquire them via phone. sir i m in b.tech final year with electronics and communication can i go for merchant navy????? i m also selected in phoenix maritime services pvt. ltd. but i don’t know much about it they take 5lac amount for giving me employment in merchant navy???? is it right to go with phoenix?? ?/ pls help me?? Yes you can go for merchant navy! You can join on the deck side for sure! I am doubtful of the Institute you are talking about! Please check the following link for the list of approved training institutes by DG-Shipping! they have a list of approved training institutes! The name of the Insitute you have spoken about does not appear in the list! I would personally recommend you to go for some other Institute! Vansh, you can join as a trainee Electro Technical Officer. By using your present qualifications, you can’t become a Deck Officer.For that route you have to again persue a Graduation in BSc Nautical Science. i am doing electrical engg. & want to join merchant so tell what to do ? HOW CAN I APPLY FOR THIS …….. This is not any company~! I don’t even work in Merchant navy! This page is created to just guide people to merchant navy. Sir,I am in 3rd year(M.E).I want to know that is their any benefit to do mtech in marine engineering after btech.Or else i should directly opt for 1 year pre sea course training.Do Mtech students get any advantage. i am intrested join merchant navy. My name is Sohan T Borge.I done my Bsc(IT) & MBA also.I have 2years industry experience.But ,i want join merchant navy.So,can you tell me i am eligible for that?? If yes,then tell me the procedure.. According to my knowledge you are eligible. There are many institutes that offers courses for merchant navy! In my article I have given information and links to Institutes, You can call them and ask them the procedure. I have cleared written test for Marine Engineer Officer conducted by Anglo Eastern College, Mumbai. what is the importance of my this result in market? will it be beneficial to join course ? Your result holds importance for only this time and this institute! It hold no value in the market! Anglo Eastern College, Mumbai is famous. You may join the course only if you are interested to get in merchant navy! I would like to warn you that there are rumors of the start of very less salaries by the shipping companies. I am sorry I do not know about eligibility in this regard. You will have to get in contact with the renowned Institutes to know about it. sir.i am complete in my diploma in mechanical engg.i am very much interested in merchant navy.can u suggest me. I am sorry I do not know about eligibility in this regard. You will have to get in contact with the renowned Institutes to know about it! Sir, i am doing BE mechanical from goa university. however i failed for 2 years. so can i still join any of these institutes after finishing my degree? Yes you can still join merchant navy! sir.i’m b.tech(mechanical engg) final year student. i want to join merchant navy and have also applied for Anglo Eastern College. i’ve cleared the written exam of anglo. they provide pre sea training for 2 yrs bt in above comments i saw that it was written that some institutes procide 1 yr pre-sea training….is there any difference btw that? samundara martime institute provie 1 yr pre sea training..
What information you are having may be more accurate! I am sorry I do not know about it as I have lost my touch from it. Myself Harmeet,i want to join merchant navy. I ve done grudation in Arts. Can I join the same. sir, does all institutes mentioned above have 100% placement ? Hi.i’ve read your article thats too good too usefull. I want to join merchant navy so please guide me. Are shipping company dont recruit enginneers just after persuing mechanical engineering. Is it compulsory to do one year post graduate course after doing B.Tech in mechanical engineering. Please help me if there is any chance of getting in mercahant navy after my B.Tech. Please provide me the list of best shipping companys in india. I am passionate to join mercahant navy. Please help me. no, Marine Engineers require some special qualities. sir i am in my 2nd year of electronics and commn. engineering under vtu..i am a bit skeptical about my chances into the merchant navy..would you plz guide me.will it be the same like the other officers who get hell like salaries? sir, i’m completed BSc. mathematics,how can i join navigation dept. in merchant navy? sir, i’m completed diploma in mech. engg. which course is best for my carrier in merchant navy? and how can i join? sir,i am a student of b.tech(mechanical engineering). I want to join merchant navy. Can you please tell me about different courses in merchant navy which i can do after b.tech and which course will be more beneficial. sir i complite diploma in mechanical engg. can i join marchant nevy? i am 3rd year student of production engineering ,so i wanted to know is there any chances for production engineer , what preparation i should do join merchant navy? I have done my B.tech in mechanical engineering with 70% in 2011. I had no working experience for past one year or can say a gap year, so my question to you is can i join merchant navy. Please reply, m confused. Question 1: After completing the course is there any guarantee* that i will get a job as 5th engineer..i mean after investing 3lakhs fee…what u say? Question 2: please throw some light on salary and promotion ????????? hey i have just finished my 10th .. and i am intrested in joining merchant navy.. how do i join? please can you help me? i am 16 years old.. i need to do my 12th.. what after that? and what institute? what course? what IMU exam? .. can you please give me all the details? sir i m shankar be mechanical engineer.My quation is am select foreign shipping company and which is highest post in mechant navy. i am doing some design cources such as catia V7,pro_engineering,autocad2009 and also piping course.but only problem is my english is littal poor.all this seen am ijoine in merchant navy. after compliting degree in mechanical which course will i do please reply me. I am sorry! I do not know! You better visit some institutes that provide training for merchant navy to the candidates. You can follow the links on this page, so that you can get their contatcts from their website. sir i have completed polytecnic mechanical engeering ? ?can i do marine engeering after polytecnic?? I have experienced 20 years in army .and i’m looking for security job in merchant navy. Please provide me some information about that. I have experienced 20years in army as a Electretion as well as auto and track veh DG Set.Iam Retired 31March 2005,and serving in Mobile Sector as a Tech 2Years,and Elect Eng 4Years,we are work on Automision Panels and DG Sets.Please conf as a Election in Merchent navy. Please contact the companies ot the institutes that i have mentioned on this page, that can provide you with the required info you want. After investing so much time and money whether they are giving job guarenty? what is the syllabus to crack the test? sir, i have completed B.E. (E & TC),Can i become chief officer by doing ETO COURSE….?? You cannot just become a Chief officer or engineer. It will take a long time to become a chief engineer/Officer or Captain. is vishvakarma maritime institute pune an appropriate one to go for gme course and is the placement guaranteed? Vishwakarma maritime institute is a good Institute. I have been to that institute before for enquiry. But I don’t have any knowledge about the placements! U will become electrical officer, then 4th engineer, then 3rd, then 2nd and then finally chief engineer. Buddy thats gonna take half of ur life. For becoming a Chief Officer you have to be an Executive Officer, ie a Navigating Officer/Deck Officer. sir i have done BTECH in INFORMATION TECHNOLOGY. can i join merchant navy..?? sorry dear, there s nothing for you. All u can do is get into pre-sea course for deck officers based on yr 10+2 scores and start all over with kids as yr colleagues. Hi Sir,I am a student of 3rd year Computer Science and Engineering and I want to join a Merchant Navy?? It is possible or not,if yes then can you provide me the procedure for taking admission And any procedure for job in Merchant Navy?? I am sorry! I don’t know! You may callup the institutes who provide training for merchant navy and ask them! Sir,Can you tell me the institutes name who provide training for Merchant Navy? Hey dushant u seem to have done a lot of research. What is it that u exactly do? R u a counselor? No. I am not a counselor! I am doing this for free! Hey buddy, i am chief officer sailing on bulkies, only mechanical, electronics , electrical, naval arch. chaps can get in. So Sir it is not possible for me to get the admission in Merchant Navy? sir, i m a b.tech 3rd year student and i want to join merchant navy and i also know the procedure how to go in. But i want to know that it is possible to take sponsership from any company before doing to gme if yes. so what is the procrdure for it???? sir, i hear that in merchant navy we can working only for 6 months but sir could we also got a salary when we are not in the ship for the rest 6 months? The salary depends upon the company. e.g Some companies may be paying 2.5 lakhs per month; Both when on-ship and off-ship, that means throughout the year! Others may pay 5 lakhs only when you are on-ship that may be half of the year! sir i am b.tech 3rd year(me) student and i want join merchant navy and i also know the procedure how to go.But sir iwant to asked u before gme it is possible to take sponsership from any company if yes so what is the procedure for that.? I am not sure. But I think you can, may be in inland waters. is swimming necessary for joining M.navy???? No! Swimming is not necessary! I have done B-TECH (MEchanical) after Polytechnic(Diploma),not done 10+2 am I eligible for Merchant Navy. sir , what is the guarantee that one will get the job after doing b.tech in mechanical and PGD in merchant navy . Get in contact with recognized Institutes. Few institutes I have mentioned on this page. Sir, i am student of mechanical engineering of 3rd year student from a privet univercity . I want to join merchant navy, so please guide me, about the process & pakages. sir i m mechanical fresher……i m interested in merchant navy….can u tell me which institute can definitely give me a job after completing the course ??? ?….or which institute have 100% placement.??? Get in contact with recognized Institutes. Few institutes I have mentioned on this page! I am sorry! I dont know. this is just an informative page! Please try contacting other institutes. Checkout the eligibility criteria and get in contact with recognized institutes to get proper information! You may have to Go thorugh IIT-JEE or AIEEE or the state entrance exams. and look our for colleges offering the courses! PLease search and verify the information. You may get in contact with the recognized Institutes in merchant navy for getting exact information. bro cud u plz tell me if their is any medical related issues that are taken under consideration. hello sir, can you suggest me some institute for preparing test for 1 year-pre sea training. or where can i know about syllABOUS. right now i am b.tech(mechanical) 3rd year student. Please contact the institutes providing training for Merchant Navy for the information you are looking for! sir i hv just joined BE mechnical please tell me that after compleating this for joing merchant navy will iit-jee scoor card is compulsury for me and please tell me what will be the next step for me to join merchant navy. i m 4th year student with information technology branch. i m intereted to join merchant navy.. Please contact the institutes providing training for Merchant Navy for the information you are looking for.! Please contact the institutes providing training for Merchant Navy for the information you are looking for. Please contact the institutes for this info. i’m getting few intimate from this site.pls give me instruction when entrance exam form will fill. sir i am 3rd year b.e. student. i want to join merchant navy but i don’t have any guidance plz tell me what can i do. Please go to the sites that i have linked on the names of the institutes. you can then get in contact with them and they may guide you! I am sorry! i DON’T know about the placement picture presently existing in merchant navy field! Sir i m i 12th PCM from chhattisgarh Bord,i want to become at least 3rd officer in merchant navy. can you tell mow how to give the IMU exam and books prefer for that ? what are the cutoffs and -ve marking if any? ? ? i heard that after 1 year DNS i have to do training on ship for 18 months then i will become 3rd officer? what about the cost of doing DNS (diploma in nautical science 1 year) ? and can you tell me the good universities which is having good placements after DNS 1 year ?should i have to join some any company after 12th?for doing diploma for 1 year? I have mentioned some very good institutes on this page! I don’t know about what is the picture of placements in merchant navy companies! Sir i m i 12th PCM from chhattisgarh Bord,i want to become at least 3rd officer in merchant navy. can you tell me how to give the IMU exam and books i have to prefer for that to prepare for exam? is that IMU & IGNOU is now same? can i join DNS after appearing entrance of IGNOU what are the cutoffs and -ve marking if any? ? ? i heard that after 1 year DNS i have to do training on ship for 18 months then i will become 3rd officer? what about the cost of doing DNS (diploma in nautical science 1 year) ? and can you tell me the good universities which is having good placements after DNS 1 year ?should i have to join some any company after 12th?for doing diploma for 1 year? IMU & IGNOU are not same! If are looking forward for getting in merchant navy IMU is the place you may be looking for. IGNOU is for distance education for many courses! The rest of the Questions you have asked I do not know about it! Sorry! how to prepare for IMU then? is it the exam was easy? can i join after 10th? sir i m in 3rd year of b.tech in m.e. iwant to join merchant navy please tell me abot it how i can join it……………………thank u……..
can i do diploma in nautical science after my 10th with 60%? and then can i join the merchant navy direct after 18 month training from any good company? tell me the good institute in India, for doing the diploma in nautical science after 10th CBSE with 60%? You will have to Complete your 12th with Maths first! i got 45% in 12th pcm..can i join merchant navy now? i didn’t gave IIT-JEE entrance after 12th ,so i don’t have its report card but i’m doing graduate engineering in mechanical approved by AICTE so can i join merchant navy after my degree? Yes you can join merchant navy after doing Mechanical Engineering! my bro is willing to join merchant navy ..
N he is confused btwn Great eastern, Anglo eastern n Manet. Please do suggest a good option. I wanna somthing n need your help bro..
SIR I AM FINAL YEAR AUTOMOBILE ENGINEER CAN I JOIN MERCHANT NAVY? IF YES FOR WHICH SIDE? PLEASE SIR SUGGEST ME. AND is PHISICAL NEED FOR THE JOB? i am sunil malik pursuing b.tech specification in computer science with 65%. i am interested in merchant navy for officer post. I am sorry. I have no information regarding that! AGGREGATE……….. NOW I WANT TO JOIN MERCHANT NAVY SO PLEASE TELL ME HOW TO APPLY FOR IT? I have already told how to apply! sir i am vineeth.vn this site helps me to know the right spirit of joining merchant navy without having any doubt all are cleared but let me know if i have 58 % only in my academic ( btech mechanical engineering ) im backward in caste but nOt belonging SC/ST categories…MAY I HAVE ANY CHANCES FOR OBC ( other backward community ) CANDIDATES ? Can i join Merchant navy after Diploma in civil? tell me how to join with legal procedure. I am Sorry! I Don’t Know! There is a possibility for you! But only in Inland Waters! Please Enquire with the Institutes providing Merchant Navy Courses. what is the salary amount of a deck officer? Don’t Run after Salary, biggest mistake you can do is to join Merchant Navy for money! Money you will get everywhere as per your qualifications and abilities,same applies here, Officers do get 8-9 lakhs pm and Officers with same rank also get 40-60 thousand pm. sir, i am doing B.E in industrial and production ( a sub branch of mechanical engineering). i wanted to know if i can get into merchant navy with a graduate degree i production engg. lookig forward to your guidance. my email id is : manasvi.vashishta@gmail.com. sir,i have completed my diploma in computer science from anna university with 68% marks.sir can i do b.tec in marine eng. Means nautical science.sir my left eye has minus 9 power.and other eye is 6/6.sir,how can i apply. I am Sorry! I don’t know! Yes you can do B.Tech in Marine Engineering or BSc Nautical Science if your age permits, your eyesight is low,you need 6/6 in both eyes for Nautical Science.Your Diploma won’t serve the purpose. No. It will not affect. You can go ahead with your degree! i am in 10 std, and i want to join merchant navy after my 12th, so is it necessary for me to apply for iit-jee or ican directly apply for merchant navy. Yes! To get in renowned Institutes you will have to prepare for IIT-JEE! I am final year mechanical student( 4 year degree). how can I apply for the merchant navy. is there any entrance exam? Keep Check on the websites of the institutes. Provided they are approved by DG shipping. is iit-jee score card necessery for marine engg??? Yes! If you want to get into good institutes! The process for Girls is the same as boys. It will be better if u apply for IIT-JEE and apply to institutes through it for geting into renouned institutes providing course in Marine engineering. Apply for IIT-JEE and also fill up a form of Indian Maritime University (IMU),By this you can get admitted to TS Chanakya ( for becoming a Navigating Officer) or MERI (for becoming a marine engineer). You can also go for DNS leading to Bsc Nautical Science Offered by Indian Maritime University with private institution partnership,although this year they are taking only sponsored candidates.OR apply for BITSAT and Gain admission to TMI (Offcampus BITS Pilani ), you can also do the Marine Engineering and Bsc Nautical Science at various other approved institues although first check for approval on http://WWW.DGSHIPPING.COM , and doing such courses from not so ruputed institutes may lead to placement problems. I am sorry!. I am also a student just like u! I too Dont know about the companies! Be very careful! their are a lot of fraud institutes! Don’t join any company as such. Since Govt. Of India does not approve any such course. DNS (Diploma in Nautical Science leading to BSc Nautical Science ) is a similar course approved by Govt. Of India. course : 2 Semesters at Institute,3 semesters at sea onboard training,1 semester back in institute. This course is only offered by Indian Maritime University (IMU) central govt. University. at their Offcampus locations and in campus. Admission can only be gained by qualifying IMU-CET. No other method can be adopted in any case. Hence the course that your company is Offering is not approved. For us also the same doubt. In our college they recruited 28 members as ETO and the procedure is same what you have said above. eligibility- a diploma or degree holder in electronics or electrical or similar streams. With some minimum cut off marks. 12th std is mandatory with PCM. after having such an qualification, one will be going through a cource which is offered only at certain institutes approved by dg shipping. for list of training institute and it’s approved cource refer to http://www.dgshipping.com , if your company is training you in such an institute which is approved by dg shipping for eto cource, then you can join the company and go through a cource, without undergoing through any cource of ETO you can’t get a job as an ETO, if your company says the institute in which you are going to get trained is not certified by dg shipping but by some other country then don’t prefer to go, since you won’t get an Indian CDC (continuous discharge certificate) which is primary for indian seafarers, hence if you meet all the eligibility criterias and undergo through a proper approved cource for ETO, you can join as a trainee ETO, under which initially you will recieve a stipend, not a salary, also to keep in mind an ETO is not a full flegded officer on a ship, he is non certified Officer unlike Navigating and Engineer Officers. well …helo..sir.i am..ri8now in +1. …i need some guide lines….fr merchant navy…..to be frank. ..wt i want..is a handsome slary. .wch..evry1 dream..of..wt should be my aim..ad %in 12th..inorder to get..a ncy slary. ..ad wch course shuld..i do…. Sir, I have completed 12th with commerce …What should ido to join merchant navy? Apply for IIT-JEE and simultaneously apply to IMU. qualify in IIT-JEE and join the maritime academies. sir i want take admission in dns or marine engineering.give me suggation to choose college in i fill up form.because i don’t know anything about marin college and syllabus? suggestion? you want to choose college? college will choose you,you will not choose the college. Apply for IIT-JEE, you can join MERI for marine engineering and TS Chanakya for BSc Nautical Science. DNS course is no longer Offered to unsponsored candidates from this year,with force of DG Shippping’s notice. Please note that the three month Deck Cadet course had been abolished by the Govt. of India in 2001, it was a course which consisted 3 months on landbased training and 36 months onboard training, before appearing for second mates (F.G). Sir i have completd my bsc in phy. with 1st class. Hello Sir. Myself Shaik Majeed, pursuing my 2nd semester of my final year B.tech(Mechanical) course from approved AICTE college.. Can I apply to merchant navy job after completion of my B.tech… Sir plzzz reply to msg… whenever. I need the guidance… So plzz help me.. abt merchant navy job or course which i have to do after my B.tech.. I wil be most thankful to u .. sir.. Yes! You can get into merchant navy after completing a course in an institute approved by DGshipping. and then u can get into merchant navy. sir please tell me about “” GLOBAL PACIFIC MARITIME SHIPPING AND MARITIME SERVICES”” …. i want to join GME(1 year course PG diploma) i m a B.Tech mechanical 2011 pass out… will i have to write any ntrance xam??? 4 d private colleges??? Iam frm hyderabad. Recently a company named phoenix maritime pvt ltd has conducted a drive for marchant navy.. And i got selected for primary rounds of selection contains aptitude n HR.. And now they are asking to come for medical check up in mumbai with 3500 dd.. if i clear my medical they are saying that i have to pay 2000 immidietly after medical to book a seat in institute for my training..They said In that training time i wil get 15k to 25k.. But people saying that this is a fake company..
Iam in big confusion to go der not. Sir pls help me to knw abt this company And what i have to do now..
i like all d info provided about this wonderful carrier ,it helped me a lot for sorting my queries regarding joining dis field thanks! I want to pursue my carrer in merchant navy as a mechanical engineer, currently i am doing my engineering from mechanical department and have got a drop in first year. Am i eligible to pursue my career in this field? i am also from hyderabad. I too got selected in the phoenix maritime services pvt ltd. And along with 20,000 they are also asking 5.5 lacks rupees for training. And after they are going to place us in some shiping industry. If you have any details of this company it will going to help us a lot sir. i am in class 11th nd i want a job in merchant navy by the help of “Marine engineerng” so, how can i prepare for dat..??? Sir I am a 10+2 student wants to join merchant navy but I have passed with commerce stream. i m cricket player …i want join merchant navy….but m done +2 in arts…can i join merchant navy???????????? I am Mechanical Engineer with aggregate less than 60% , i am now working as Design Engineer in Mining Machinery Manufacturing from past 2 yrs so i am deeply interested in transmission and Hydraulics . I want to join Merchant Navy as an Engineer , i am confused when will the 1 yr Pre-sea course starts and which Institute is better from which place . I am from Vizag , institute in vizag was not well reputed but recognised i dont know about the placements.